Clif Bars are packed with calories and multiple types of easy-to-digest carbohydrates. This is great if you’re about to head out on a run or long hike and not so great if you’re chomping on one in front of the TV. Originally created for athletes and active people, they’re now a common midday snack for sedentary people, for whom there are no benefits and some drawbacks. When the first ingredient in a seemingly healthy granola bar is sugar, take notice. 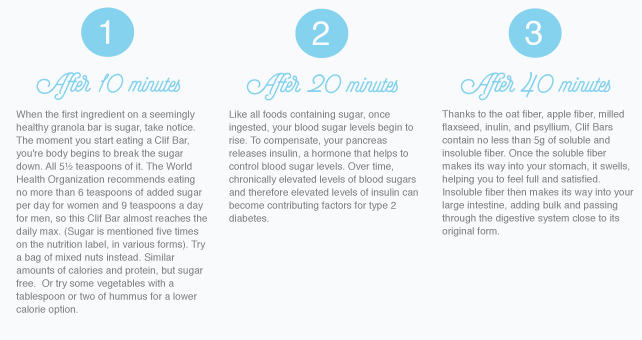 The moment you start eating a Clif Bar, your body begins to break the sugar down — all 5 1/2 teaspoons of it. The American Heart Association recommends eating no more than 6 teaspoons of added sugar per day for women and 9 teaspoons a day for men, so this Clif Bar almost reaches the daily max (sugar is mentioned five times on the nutrition label, in various forms). Try a bag of mixed nuts instead, which has similar amounts of calories and protein, but is sugar-free. Or try some vegetables with a tablespoon or 2 of hummus for a lower calorie option. Like all foods containing sugar, once ingested, your blood sugar levels begin to rise. To compensate, your pancreas releases insulin, a hormone that helps to control blood sugar levels. Over time, chronically elevated levels of blood sugars and therefore elevated levels of insulin can become contributing factors for type 2 diabetes. Thanks to the oat fiber, apple fiber, milled flaxseed, inulin, and psyllium, Clif Bars contain no less than 5 grams of soluble and insoluble fiber. Once the soluble fiber makes its way into your stomach, it swells, helping you to feel full and satisfied. Insoluble fiber then makes its way into your large intestine, adding bulk and passing through the digestive system close to its original form. 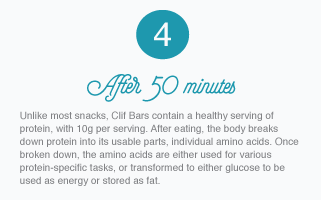 Unlike most snacks, Clif Bars contain a healthy serving of protein, with 10 grams per serving. After eating, the body breaks down protein into its usable parts, individual amino acids. Once broken down, the amino acids are either used for various protein-specific tasks, or transformed to either glucose to be used as energy or stored as fat. 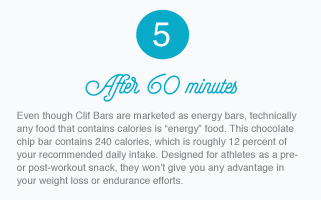 Even though Clif Bars are marketed as energy bars, technically any food that contains calories is “energy” food. 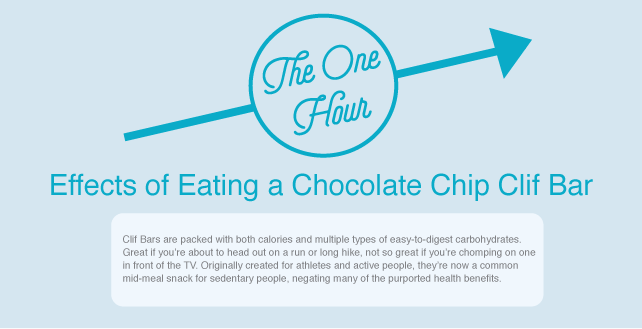 This chocolate chip bar contains 240 calories, which is roughly 12 percent of your recommended daily intake. Designed for athletes as a pre- or post-workout snack, they won’t give you any advantage in your weight loss or endurance efforts. 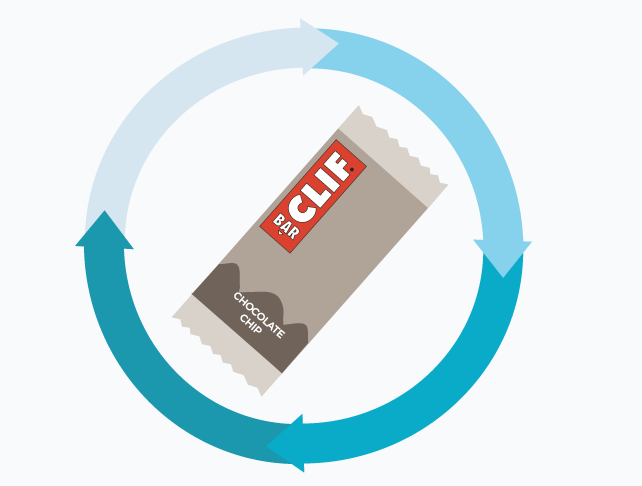 Clif Bars are designed for people who need quick energy before, during, or after a workout. High in calories, they also contain 44 grams of carbohydrate to help fuel your muscles or replenish your glycogen stores. Grabbing a Clif Bar for a long hike is a great idea, but if you’re eating this while sitting on the couch, you’re better off with a more nutritious snack. Something with minimal added sugar that is high in fiber and unprocessed carbohydrates, healthy fats, and protein will boost your energy levels and provide as much sustenance as a Clif Bar.